Gods in Oriental Mythology had a special ability. They could fly. However, ordinary mortals could master the unique art of flying too. For example, Indian Brahmans, yogis, hermits and fakirs could rise and float in the air. There is a chapter in the Vedas on levitation, a sort of guidelines on how to reach a state required for taking off the ground. Unfortunately, the meaning of many ancient Indic words and concepts has been irretrievably lost over the last few centuries and therefore the invaluable instructions can not be translated into modern languages. As regards the ancient levitators, records at hand say that they were able to rise above the ground up to 90 cm. They did not lift off to impress the onlookers, they simply wanted to assume the most suitable position for performing religious rites. The art of levitation still exists both in India and Tibet. Many scholars engaged in oriental studies also mention the phenomenon of “flying lamas.” Alexandra David-Neel, a British explorer, one day witnessed the flight of a Buddhist monk. The monk flew a few dozen meters over the alpine plateau Cnang Tang. He was bouncing off the ground like a tennis ball to rise in the air again and again. He kept his eyes on some guiding star hanging somewhere in the distance, the monk was the only person who could see the star in broad daylight. Europeans have long been aware of levitation too. There was one big difference between Eastern and Western medieval levitators. Unlike the Brahmans, yogis and lams, the monks in Europe never took any special training for levitational purposes. They would normally rise in the air after reaching a state of ultimate religious ecstasy. According to trustworthy records, Saint Theresa, a Carmelite nun, was one of the first levitator of the Middle Ages. Her flight was seen by 230 catholic priests. The nun wrote about her unusual “gift” in the autobiography dated 1565. It is quite noteworthy that Saint Theresa herself did not want to fly. She spent long hours praying desperately in an attempt to get rid of her special power. She was asking Lord to relieve her of that grace. One night the Almighty finally heard the nun’s praying. She did not fly ever since that night. Josef Desa used to be the most famous “flying man.” He was born into a devout family in South Italy. Since he was a boy, Josef was a very religious person prone to inflicting all kinds of torture upon himself in order to experience a state of religious ecstasy. Later he joined the Franciscans. He would get really ecstatic at times and rise in the air. One day he floated right before the Pope’s very eyes. Josef arrived in Rome. The Pope Urban VIII granted him an audience. Josef got as excited as one could be. He could not help rising in the air. The head of the Order of St. Francis eventually brought Josef back to earth. Men of science observed more than a hundred cases of levitation of Josef. They put down their comments in the official records. However, the Christians were thought to be embarrassed by Josef’s flights. As a result, Josef was sent to a out-of-the-way monastery in 1653. He was transferred to another monastery three months later, then to another one. The list can go on. Wherever he appeared, the news about the “miracle man” spread like wild fire. People from the neighboring towns and villages stood outside the monastery walls waiting for a miracle. Finally, Josef was transferred to a monastery in Osimo where he died in the fall of 1663. He was canonized four year later. Hewm learned to levitate of his own free will later on. He showed his outstanding ability to thousands of spectators including such celebrities as William Makepeace Thackeray and Mark Twain, Napoleon III, other politicians, doctors and scientists of note. Hewm has never been accused of hoaxing an audience. 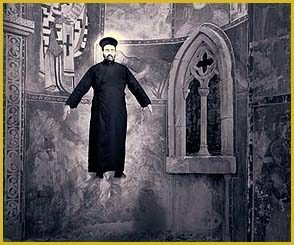 There is a lot of controversy regarding a physical nature of levitation. Some researchers say that it is a product of the biogravitational field created by a special kind of mental energy emitted by the human brain. Doctor of Biological Sciences Alexander Dubrov is a supporter of this hypothesis. Dr. Dubnov points out that the biogravitational field is deliberately created by a levitator and therefore the latter can control the field and change the direction of a flight.